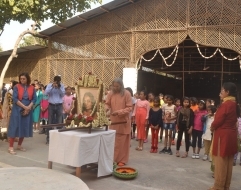 To commemorate Guruji’s birth anniversary and to mark the 10th year anniversary of YSS Gurugram Kendra, a spiritual programme was conducted at the meditation centre on January 5, 2019. It included prabhat feri, energization exercises, group meditation and pushpanjali, followed by breakfast for over 60 devotees who participated in these programmes. In the morning, Guruji's palki (palanquin) decorated with garlands was carried by devotees in a procession around the Kendra. Each one in the procession got the opportunity to carry the palki as they chanted bhajans throughout the journey of the prabhat feri. Returning to the Kendra, they proceeded for energization exercises and group meditation. At the close of the programme, they offered pushpanjali at the altar, following which they were served breakfast. On Sunday, January 13, Janmotsav was celebrated at YSS Gurugram Kendra through a programme for local devotees. 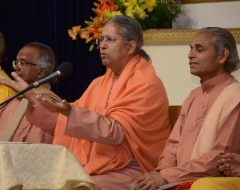 Swami Lalitananda conducted the group meditation and pushpanjali programme. Swamiji spoke about the early years of Paramahansa Yogananda and the importance of a sadguru in one's spiritual journey. 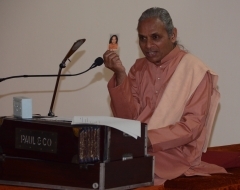 He elaborated aspects of the unconditional and all-loving Guru-disciple relationship and how a Guru’s guidance and help is always available to a devotee who is in tune with Him. Following the programme, devotees were served Guru Langar. In the Narayan Seva, a charitable activity where volunteers serve food on to the underprivileged, around 150 persons were fed. The programmes on this day drew nearly 220 devotees to YSS Gurugram Kendra. A parallel Children Sunday Satsanga class was conducted by volunteer teachers. It as attended by around 15 children. On this day, digital verification for New YSS lessons was carried out for devotees visiting Gurugram Kendra. 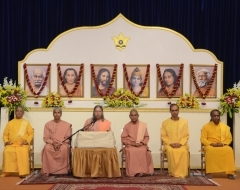 These two occasions – Janmotsav and 10-year-completion of YSS Gurugram Kendra – were also marked by a 10-hour-long meditation held on Sunday, January 20 from 10 am to 8 pm. Around 90 devotees joyously participated in this meditation. To view images from these programmes, and from Janmotsav celebrations at YSS Delhi Kendra, click here.